If a tree falls in the forest and no one’s around to hear it… So begins the old philosophical puzzle about what makes something really real, though today it would be, If someone didn’t watch it—especially on film, or video, or some website—would it really exist? Which is how you get young thugs beating up someone, filming it, then posting it immediately on YouTube or Facebook. That’s what makes it real, I guess: how many people watch it…including the police. 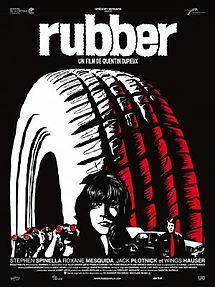 The dialogue in Quentin Dupieux’s really odd film Rubber begins when a police man, crawling nonsensically out of a car’s trunk, addresses us about all the things that don’t make sense in movies. This prepares us for seeing a tire slowly twist itself out of the ground, and, after crushing a plastic bottle and a couple of insects, realize it has telepathic powers that can kill things—first a rabbit, then a bird, then people. All of this a group of people watch through binoculars. It’s their watching that keeps this movie and its murderous tire star keep going. When the police man who had first addressed us—he’s the master puppeteer—decides he’s had enough of the movie, he has the watchers killed. Having watched in the desert for hours, they’re starving by the next morning and ravenously descend upon a poisoned turkey. All except one. He lives and continues watching, and so no one—not even “the master”—can stop. The movie must continue. Tired of the tire and wanting to speed up the film’s ending, the master finally just blows the murderous tire away, handing the remains to the lone watcher. Suddenly, however, the lone watcher realizes the tire’s been reincarnated—as what I’ll let you discover: it’s so fitting and even crazier than the tire bit—and the reincarnation blows him away. But the film still doesn’t end. The reincarnation rolls down the street, a pied piper now, tires coming to life everywhere it passes and joining a growing procession of tires which finally comes to rest in front of famous letters on a Los Angeles hill. H-O-L-L-Y-W-O-O-D. It’s going to take the concentrated telepathy of the reincarnation and all those tires to blow that up. If you don’t like something, then don’t watch it. This movie has a more cynical take on that simplistic cliche. Rubber finally says it’s not enough to blow up everyone in an audience, or even the actors in a film. You have to blow up HOLLYWOOD itself, and this weird indie film makes the prospect feel like an actual solution. But, of course, it isn’t. Hollywood may have turned reality into film, but the Internet, and YouTube, and Facebook have turned reality into a screen—something everything seems to have these days. We watch them—screens—incessantly, 24/7. In colleges and universities some are beginning to use the term “screen studies” instead of “film studies.” And if someone—like you—isn’t on a screen, how real can you be, after all? Blowing up Hollywood would be just a beginning. This entry was posted in Reviews & Commentary and tagged Hollywood, movie reviews, Quentin Dupieux, reality, Reviews by Richard R. Guzman, Rubber The Movie. Bookmark the permalink.